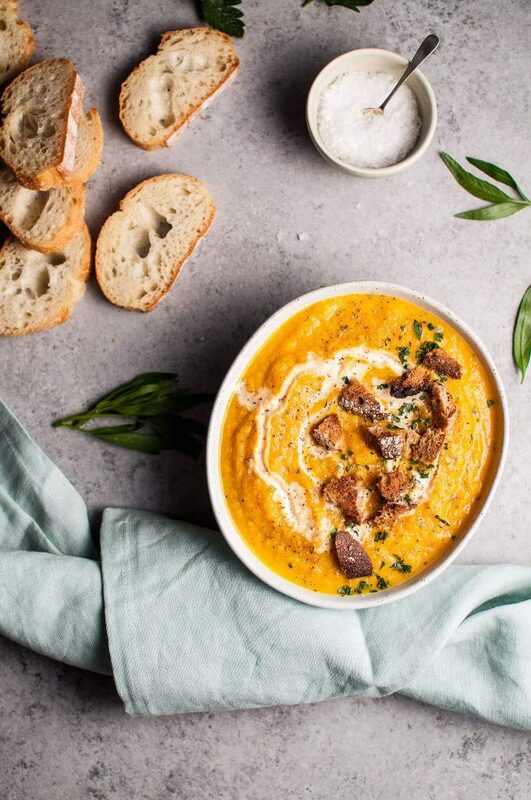 This soup isn’t over-the-top pumpkin if you know what I mean. Cauliflower is a nice filler and good for you. This vegan pumpkin soup tastes quite similar to my acorn squash and carrot soup, if you’ve tried that one. 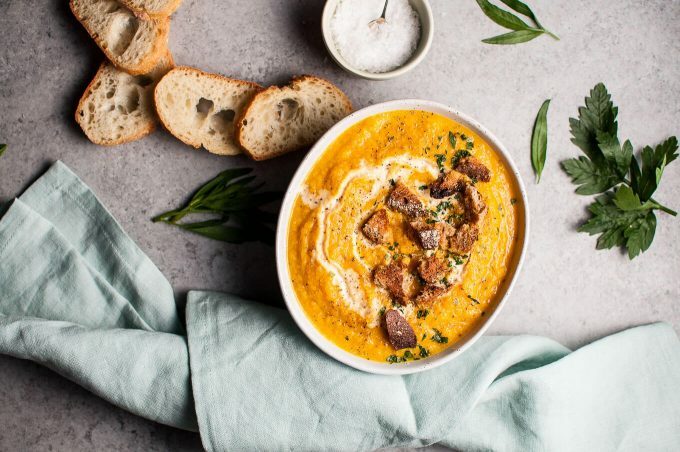 This pumpkin soup with canned pumpkin is really easy – you don’t have to mess around with fresh pumpkin. I picked a perfect day to make this as it’s cold and rainy outside. I just got back from Arizona. Hello weather shock. And hello pumpkin! I think I mentioned last fall that I don’t go all cray-cray for pumpkin season. I don’t get the fuss. I don’t drink coffee so I don’t pumpkin spice my latte. I don’t have a big sweet tooth so I don’t pumpkin spice my muffins or whatever. I don’t like pumpkin pie. Too much mush, not enough crust. 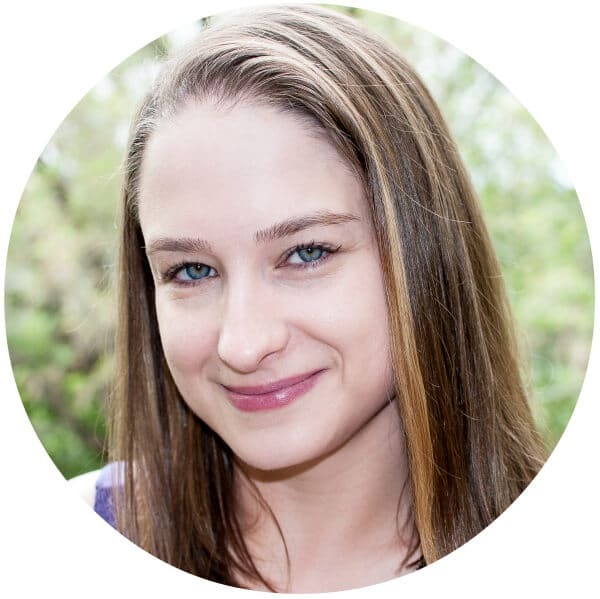 With all that said, this blog isn’t really about me. If it was all about me, I would have photos of burgers, steak, tzatziki, and olives all the time. Does anyone want that? I doubt it. I aim to please. I know some people like healthy pumpkin soups. It’s not that I don’t like it. It’s a really good post-vacation detox soup actually. And that color is so bright and happy! It’s just that when I’m in Arizona I get my fill of In-n-Out Burger and Chick-fil-A. Now I’m back to bunny food… AND LOVING EVERY MINUTE OF IT. Cough. Right. 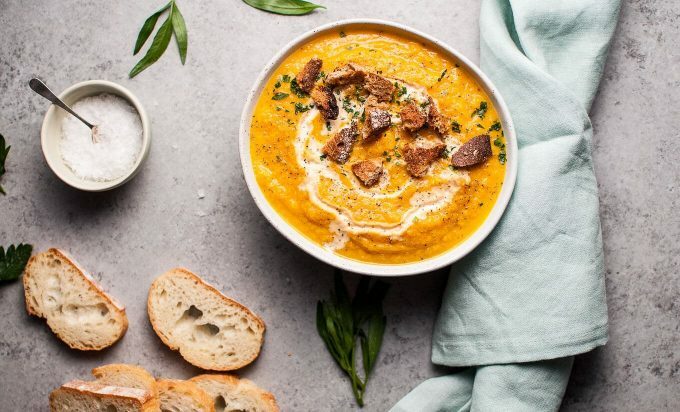 Will you make this healthy pumpkin soup recipe? Vegetarian and vegan friendly pumpkin and cauliflower soup with ginger. A perfect fall soup! Sauté the onion, celery, and carrot in a large pot on medium heat for 5-7 minutes. Add the ginger and garlic to the pot, stir, and cook for 2 minutes until fragrant. Add the vegetable broth, pumpkin purée, water, dried thyme, cumin, and salt & pepper to taste. Add the cauliflower (I used my hands to break it down into smaller florets). With the lid slightly ajar, simmer the soup on medium-low heat for about 30 minutes or until the vegetables have softened. Purée the soup in batches using your blender. I suggest letting the soup cool for a bit first. The soup will be quite thick. You can add water to thin it out a bit (I added an extra cup). You may need to add more salt. Serve with a swirl of cream if desired. *If you're very sensitive to spice or don't like ginger, I recommend halving the amount. I recommend using fresh ginger. Here in Canada, the only pumpkin puree I could find in my store was in a rather large can. It won't make or break the recipe if yours isn't exactly 27 fluid ounces, so feel free to use 2 smaller cans or whatever works that's in the same ballpark. You may also like my cauliflower leek soup, my easy curried pumpkin soup, or my roasted butternut squash and cauliflower soup. I don’t comment on blogs all that much these days, but this looks so good I had to say something! 🙂 Gorgeous photos, and the soup is right up my alley. Natasha this looks stunning!!! I want to ask – did you shoot this in artificial or natural lighting? This just pops so wonderfully and looks so delicious! Thanks, girl!! Artificial light – that’s all I use these days. Yeah, it is hard being a food blogger during the Canadian winter – that’s for sure. This soup sounds delicious Natasha. Perfect to welcome fall.I love the addition of the ginger and also love the cauliflower. Thank you!! I’m not quite ready for fall yet, but what can you do? Mmm this sounds delicious! The fall will be here before we know it! Thanks for sharing! Oh my I love the color of this! Such a beautiful presentation! I usually add bacon to the top, as weird as that sounds! Perfect fall soup. I added some cinnamon, a dash of cloves and cayenne. Make sure you use a blender to purée I used my vitamix, it adds a creamy, velvety texture. This sounds like a great idea! Pumpkin can be a really strong flavor, so I bet the cauliflower tones it down nicely. I’d love to try this soup but I’m working to avoid dairy. Has anyone tried substituting coconut milk or coconut cream? Pumpkin soup is a favourite of ours (here in Somerset, England). I’d roasted an enormous Mammoth Pumpkin, made soups and frozen them, along with batches of pumpkin puree – perfect for recipes such as yours. Thank you for sharing. Did you use fresh or ginger in a pot? Hi Anna! I’m sorry to hear that. I used fresh ginger and finely chopped it. Did you use powdered ginger? If so, the 2 tablespoons would be way too much. Bland, skunky, and a total waste of ingredients. I am so disappointed I decided to make this. Did you add salt to it? I seriously LOVE this soup!! I’ve made it twice in the last month. I use just 1 15-oz can of pumpkin and almond milk instead of cream. Today I added a little nutmeg. 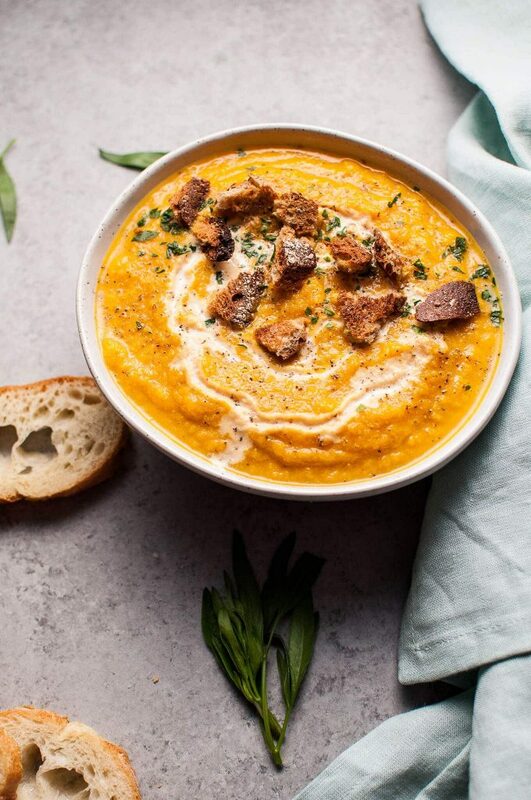 A family favorite is my Spicy Pumpkin Soup Recipe and I was looking for ideas for “Anti-Cancer Fighting Foods” to add to it and your recipe met the bill! I did also use Chorizo and Ground Sausage and spiced it up with some Orange Habanero Hot Sauce! Thank you for the inspiration! My entire family LOVED it! Mmmm your additions sound delicious!